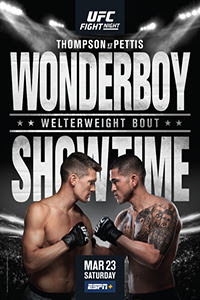 UFC on ESPN+ 6: Thompson vs. Pettis took place March 23, 2019 at Bridgestone Arena in Nashville, Tennessee. • Stephen Thompson vs. Anthony Pettis: Anthony Pettis def. Stephen Thompson via KO (superman punch) at 4:55 of Round 2. • Curtis Blaydes vs. Justin Willis: Curtis Blaydes def. Justin Willis via unanimous decision (30-27, 30-26, 30-25). • John Makdessi vs. Jesus Pinedo: John Makdessi def. Jesus Pinedo via unanimous decision (30-27, 30-27, 29-28). • Deiveson Figueiredo vs. Jussier Formiga: Jussier Formiga def. Deiveson Figueiredo via unanimous decision (30-27, 29-28, 29-28). • Luis Peña vs. Steven Peterson: Luis Peña def. Steven Peterson via unanimous decision (30-27, 30-27, 30-27). • J.J. Aldrich vs. Maycee Barber: Maycee Barber def. JJ Aldrich via TKO (strikes) at 3:01 of Round 2. • Alexis Davis vs. Jennifer Maia: Jennifer Maia def. Alexis Davis via unanimous decision (29-28, 29-28, 29-28). • Angela Hill vs. Randa Markos: Randa Markos def. Angela Hill via submission (armbar) at 4:24 of Round 1. • Chris Gutierrez vs. Ryan MacDonald: Chris Gutierrez def. Ryan MacDonald (30-27, 30-27, 30-27). • Jordan Espinosa vs. Eric Shelton: Jordan Espinosa def. Eric Shelton via unanimous decision (29-28, 30-27, 30-27).